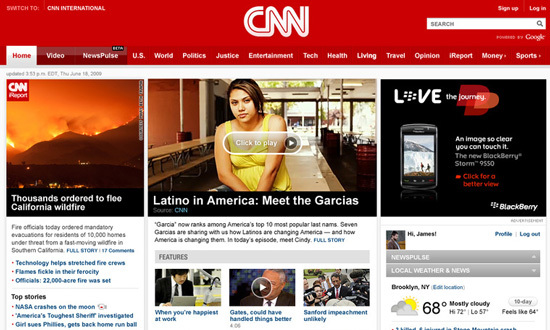 CNN invited journalists to an event Thursday to offer up a sneak peek at the cable network’s new Web site. A full screen of the site’s new homepage and more details after the jump. The new CNN.com shifts a little from the site’s current clean, minimalist design, changing out the clean white header for a bold red one. The CNN logo is also centered in the header rather than parked on the left side. The homepage features large photographs, bucking the small images introduced in the last redesign. The new look seems to be more in line with the direction other news sites are heading, especially rival MSNBC.com. However, unlike MSNBC, CNN appears to be integrating a banner ad into the main headline area of the site. It’s interesting to note that, at least in the sample shown here, the ad blends into the news content — perhaps a bit too much. It also appears, at least from this screenshot, that CNN will be placing video front and center on the new homepage, with the center image doubling as a video player. Also included in the upper part of the page are several “feature” and “most popular” video thumbnails. 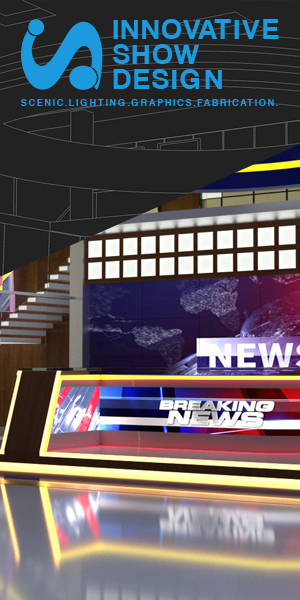 Below the main area, the new look includes a three-by-three grid of headline link boxes styled very similar to the current look. These boxes do a good job of finding the fine line between offering users a wide selection of story links while not over-cluttering the design. CNN.com is also planning to unveil the beta version of a new product, called “NewsPulse” that’s be billed as an “iTunes” of news allowing users to view popular CNN.com content with custom filters and sort orders.